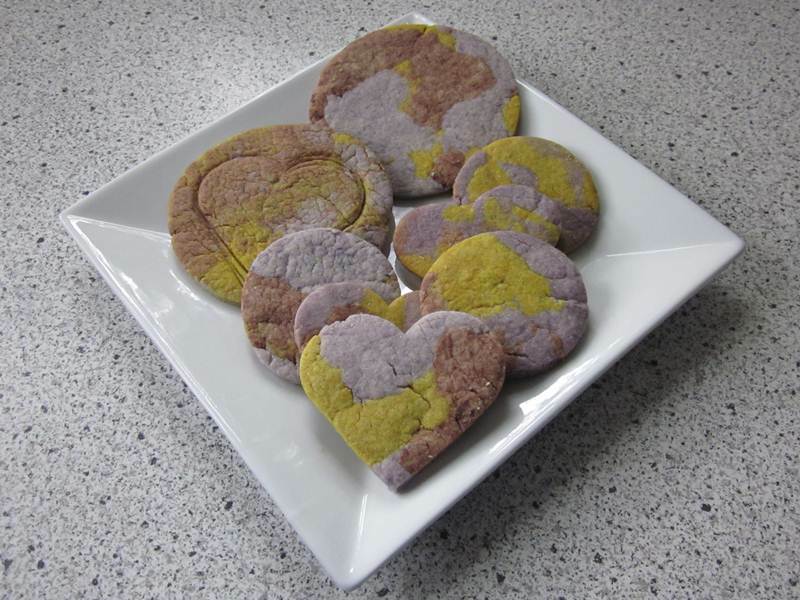 To celebrate Earth Day 2012, why not whip up a batch of sweet vanilla almond sugar cookies in colors that mimic the earth. These cookies are all organic with natural food coloring and have a lovely almond-vanilla flavor and a perfect sugar cookie texture. 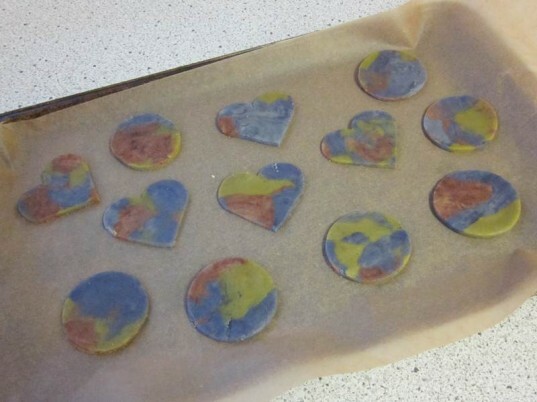 These little Earth Day treats are fun and easy to make, and also encourage your young children to learn a little bit about the planet they inhabit. 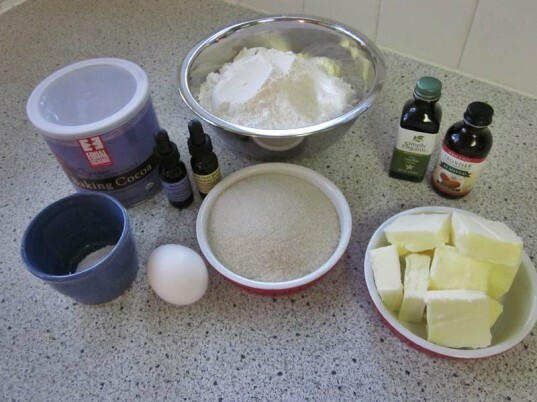 I found this yummy dough recipe at Bake at 350 – although I added more vanilla. Gather up the following ingredients. Using a hand mixer, mix your butter and sugar together until creamy. Add your egg, plus the vanilla and almond extracts and mix again until super creamy smooth. Add the baking powder to the flour and mix well. Add the dry mixture about a third at a time into the wet mixture. I used a hand mixture for the first two cups of flour, then used my hands for the last. 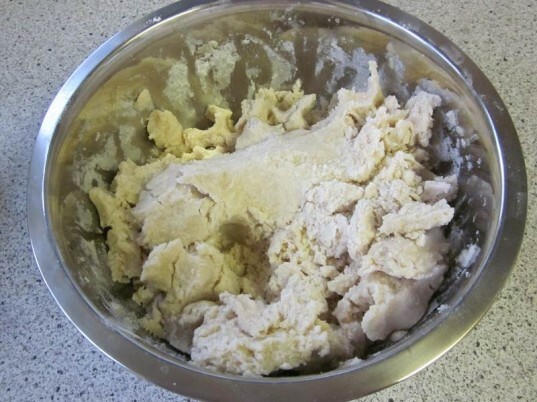 This dough won’t be silky smooth – it’ll be a little crumbly, which is perfect and how you want it. Before you start coloring the dough, you may want to check out some information about the earth. The USGS is a science organization that provides in-depth information about the world we live in, the health of our ecosystems and environment, plus looks at the natural hazards that threaten the planet, and people living on the planet, including the impacts of climate and land-use change. On this site your kids can read about the earth’s surface and other cool earth tips. My son and I visited this site to figure out how much of our cookie dough should be “water” colored (70%) and how much should be land colored. About the food coloring: For a while now, I’ve been making my own food dye or using India Tree natural food coloring. I get mixed results from India Tree though, so for these cookies I decided to try a new natural food primary coloring set from Chocolate Craft. The Chocolate Craft colors were awesome and cost way less than India Tree, so I’d recommend them. To make the green “land” dough we mixed yellow and blue. 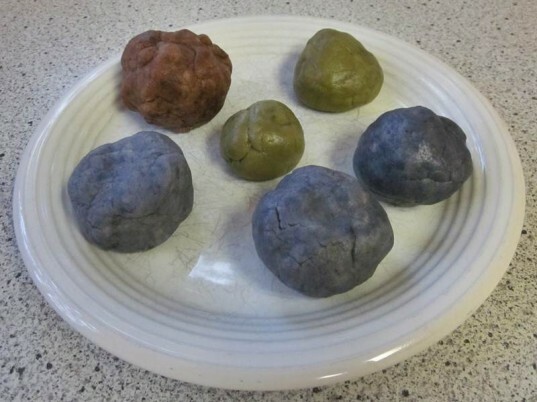 We used blue to make the “water” colored dough and for the brown earth we simply added a tablespoon of cocoa powder to the dough. Natural food colors take some time to mix in, but it’s worth it to avoid fake food additives. Also, because these are all natural, and more subtle, they really mimic the earth’s colors in a way that fake food dye won’t. Getting the dough just right for the rolling part is a little tricky, but fun for kids. If you’re working to scale, have your kids grab 70% blue dough (the amount of water on earth) and the other 30% should be a mix of green and brown to represent the land. You need to lay the various colors together in clumps then pinch the colors together before rolling. If you fail to pinch, the dough’s various colors will come apart when you roll. After pinching your clump of dough, use a rolling pin to roll out a small sheet of dough that’s about 1/4 inch thick or even a little bigger. IMPORTANT TIP: We tried rolling the dough thinner for one batch, and got rock-hard cookies. This almond vanilla cookie dough is amazing – super tender and flaky and yummy IF you roll it thick enough. This is not dough you should roll paper thin, unless your goal are little cookie ornaments, which is cool, but not edible. After rolling your dough cut out shapes. After cutting out cute shapes, place your cookies on a parchment lined baking sheet, or a lightly greased baking sheet. If you like you can sprinkle them with some colored or plain organic sugar. Bake at 350 degrees for about 7-10 minutes depending on your oven’s heat. The cookies will look a little puffy and undone when you take them out, but remember, they’re still hot and will bake a bit longer out of the oven. After taking them out of the oven, move them to a cooling rack asap. Then eat and enjoy! 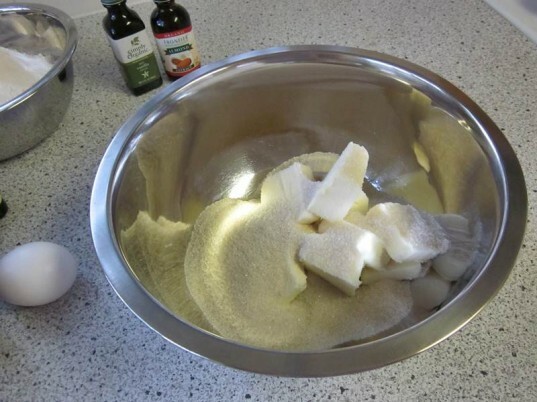 Add the baking powder to the flour and mix well. Add the dry mixture about a third at a time into the wet mixture. I used a hand mixture for the first two cups of flour, then used my hands for the last. This dough won't be silky smooth - it'll be a little crumbly, which is perfect and how you want it. Before you start coloring the dough, you may want to check out some information about the earth. The USGS is a science organization that provides in-depth information about the world we live in, the health of our ecosystems and environment, plus looks at the natural hazards that threaten the planet, and people living on the planet, including the impacts of climate and land-use change. On this site your kids can read about the earth's surface and other cool earth tips. My son and I visited this site to figure out how much of our cookie dough should be "water" colored (70%) and how much should be land colored. About the food coloring: For a while now, I've been making my own food dye or using India Tree natural food coloring. I get mixed results from India Tree though, so for these cookies I decided to try a new natural food primary coloring set from Chocolate Craft. The Chocolate Craft colors were awesome and cost way less than India Tree, so I'd recommend them. To make the green "land" dough we mixed yellow and blue. We used blue to make the "water" colored dough and for the brown earth we simply added a tablespoon of cocoa powder to the dough. Natural food colors take some time to mix in, but it's worth it to avoid fake food additives. Also, because these are all natural, and more subtle, they really mimic the earth's colors in a way that fake food dye won't. Getting the dough just right for the rolling part is a little tricky, but fun for kids. If you're working to scale, have your kids grab 70% blue dough (the amount of water on earth) and the other 30% should be a mix of green and brown to represent the land. You need to lay the various colors together in clumps then pinch the colors together before rolling. 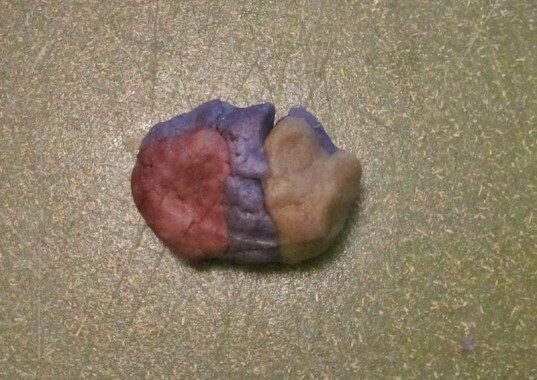 If you fail to pinch, the dough's various colors will come apart when you roll. After pinching your clump of dough, use a rolling pin to roll out a small sheet of dough that's about 1/4 inch thick or even a little bigger. IMPORTANT TIP: We tried rolling the dough thinner for one batch, and got rock-hard cookies. This almond vanilla cookie dough is amazing - super tender and flaky and yummy IF you roll it thick enough. This is not dough you should roll paper thin, unless your goal are little cookie ornaments, which is cool, but not edible. After rolling your dough cut out shapes. After cutting out cute shapes, place your cookies on a parchment lined baking sheet, or a lightly greased baking sheet. If you like you can sprinkle them with some colored or plain organic sugar. Bake at 350 degrees for about 7-10 minutes depending on your oven's heat. The cookies will look a little puffy and undone when you take them out, but remember, they're still hot and will bake a bit longer out of the oven. After taking them out of the oven, move them to a cooling rack asap. Then eat and enjoy!